I recently spent a wonderful time at Cantrell Primary School in Nottingham. 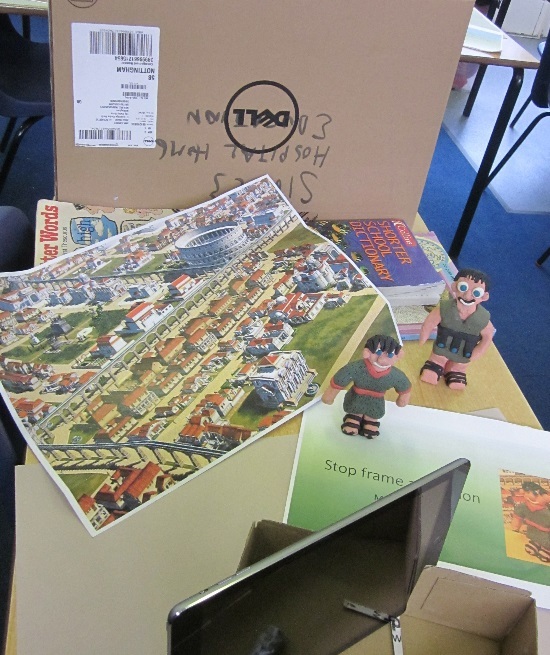 In year 4 our focus was to explore stopframe animation on the theme of A Roman adventure. We used iPads and the Zu3D app. Children worked in pairs having already made their plasticine models. Setting up the stage and workspace is key to success in stop-frame animations. Our stages were a collection of old computer boxes with an A3 image blutacked to them. To raise the characters we used a pile of books covered in sugar paper and the ipads were supported vertically using a stand fashioned from a copier paper box lid. A bit Heath Robinson but it works and is cheap! If you are unfamiliar with the Zu3D app it will be helpful to know that it has a really easy to use interface and in addition to capturing and editing frames it is possible to add music and sound effects, record voice overs, add and edit titles and subtitles and add speech bubbles. We didn’t explore the ability to group frames and the copy, paste and reverse them. 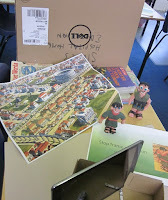 The class were completely engaged by the task, collaborated well with their partners and met a really tight deadline to complete their animations. The results were fantastic!